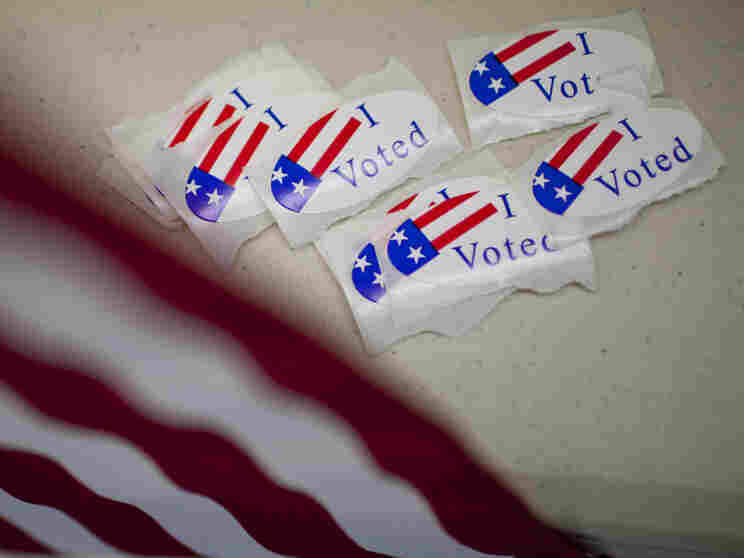 Why New Photo ID Laws Mean Some Won't Vote Most Americans use photo IDs daily. And their driver's license — perhaps the most common form of government-issued photo ID — has become indispensable. So what's the big deal about new laws requiring a government-issued picture ID to vote? Some who have always voted, but can't in 2012, explain. Stickers at a Nevada polling place on Election Day 2010. The argument over whether voters should have to present photo identification at the polls usually splits along party lines. Republicans who favor the requirement say it prevents ballot fraud. Democrats and election rights groups who oppose it say it is meant to suppress turnout. And people of all political stripes wonder what all the fuss is about. Most Americans are accustomed to whipping out photo IDs at work, the bank or even their own apartment buildings. And their driver's license — perhaps the most common form of government-issued photo ID — has become just as indispensable. "I get that all the time: 'What's the big deal? I just got my driver's license renewed, it took like five seconds,' " says Larry Norden, acting director of the Democracy Program at the Brennan Center for Justice at New York University, which opposes these laws. "Frankly, that's why these laws have been so successful, because 89 percent of the population does have photo IDs." That leaves another 3.2 million Americans who don't possess a government-issued picture ID, according to a recent study co-authored by Norden. In 2008, the Supreme Court upheld a voter-identification law in Indiana, saying that requiring voters to produce photo identification is not unconstitutional and affirming that states have a "valid interest" in improving election procedures and deterring fraud. Four years later, 31 states require voters to show some form of identification at the polls. Fifteen of them require photo IDs. At least five of those states just recently passed tough new photo ID voting laws that could affect voters for the first time in 2012. The Justice Department is now involved (so far, rejecting a South Carolina law), and the courts are soon to follow due to the growing number of lawsuits challenging these laws. As the battle intensifies, some basic questions are being raised: How many Americans don't have government-issued picture identification? And how, in this era of post-9/11 security and digital commerce, could anyone function without it? By all estimates, those least likely to have a government-issued photo ID fall into one of four categories: the elderly, minorities, the poor and young adults aged 18 to 24. The Brennan Center estimates that 18 percent of all seniors and 25 percent of African-Americans don't have picture IDs. Seniors traditionally have been the most consistent voting group, particularly in absentee balloting. Turnout among minorities has steadily risen over the years and reached a record in 2008 (when the rate of black turnout virtually equaled that of whites for the first time). Also in 2008, turnout of under-24-year-olds reached its highest rate since 1992. Why Don't They Have Photo IDs? Many people have multiple forms of identification, including those that display their pictures — like employee badges or credit and debit cards. But states with strict voter ID laws require people to have certain photo IDs issued by governments. That typically means driver's licenses. But many seniors and many poor people don't drive. In big cities, many minorities rely on public transit. And many young adults, especially those in college, don't yet have licenses. A good number of these people, particularly seniors, function well with the IDs they have long had — such as Medicaid cards, Social Security cards or bank cards. Among the elderly, many of them have banked at the same branch for so long that tellers recognize them without needing to see their IDs. They also may rarely need to cash or deposit checks, relying instead on the direct depositing of Social Security and pension payments. "The people we're finding are very poor people, people who never drove — and it's surprising how many people are like that," says Larry Dupuis of the American Civil Liberties Union of Wisconsin, which has filed suit to overturn that state's voter ID law. "They tend to be older people, often women. They also never had a need for a state ID card. There are many things you don't need an ID card for that people think you actually need one for." Among minorities in poor and rural communities, it's common to bypass banks with their paychecks and rely on cash-checking stores, which will accept most forms of photo ID. Many states offer non-driver IDs that can be displayed when voting, often provided by motor vehicle agencies. But that can create a host of problems for some. Rural residents can live great distances from state motor vehicle offices. And some state motor vehicle agencies have chronically long wait times for customers. In Tennessee, which has a new voter ID law, the governor has raised concerns about whether offices are prepared to handle an increased volume of ID seekers. In most states with voter ID laws, citizens must present birth certificates to obtain new photo IDs. Seniors and those born in rural areas, in particular, face a difficult time meeting the requirement because birth certificates weren't regularly generated in the 1930s and earlier. And many of these people were delivered by midwives, who often improperly spelled babies' and parents' names on birth documents. People are caught in a Catch-22: You need a birth certificate to get this ID, but to get a birth certificate you have to have an ID. Elisabeth MacNamara, League of Women Voters. Here are three longtime voters and their stories in trying to comply with new voter ID laws. When Thelma Mitchell, a retired state employee, learned that her old employee ID (which was issued by the state and included her photo) wouldn't meet Tennessee's new voter ID law, she went to a motor vehicle office to obtain a valid photo ID. The agency asked her for a birth certificate, but she didn't have one and was denied her request for a new ID. Mitchell, 93, has never had a birth certificate. She wasn't born in a hospital and was delivered by a midwife, in Alabama in 1918. Birth certificates, particularly for African-Americans in the South, weren't regularly generated at the time. As a result, Mitchell may not be able to vote this year for the first time in decades. "I got so mad" about being turned away, Mitchell said in an interview. "I was holding my peace to keep from telling him off. So I didn't get to vote." Another obstacle for Tennessee seniors: The state doesn't put photos on the licenses of drivers over age 65. This practice affects some 30,000 people, according to voting rights advocates in the state. At age 96, Florence Hessing is disabled, rarely leaves her home and votes by absentee ballot. She has a driver's license that expired a few years ago. She wrote to the state asking the requirements for obtaining a new photo ID under the state's recently enacted voter ID law. The response she received outlined the requirements and included a $28 fee — which angered Hessing because she expected the ID to be free. Hessing first had to come up with a birth certificate. She wrote to Iowa, where she was born, but the state had no official record. "I think that's a shift if I can't vote," Hessing said in an interview. "It'd feel like I was thrown out." Like Hessing and Mitchell, Frank, 84, was denied in her application for a new voter ID because she lacked a birth certificate. She was born in Wisconsin, has lived in the same home for 83 years and never had need of the document. "After I was married, we made several trips into Canada. I used my baptismal certificate to cross all the time," Frank said. "That's all I ever needed." She called her county's registrar of deeds, to no avail. The state's vital records office managed to find her birth certificate, but there were other problems — both her parents' names were misspelled, rendering the document invalid. "In order to get it corrected, I'd have to amend it. And it would cost $200," Frank said. "I decided I didn't want to spend $200 for the right to vote because I've always thought the right to vote was free. I don't think it's fair."